July 23rd, 2011 3:53 PM by Lehel S.
After years as the lending market's undesirables, aspiring home buyers with less-than-stellar credit are being offered home loans again—with some of the same conditions and catches critics say tripped up subprime borrowers five years ago. According to analysts, a handful of private investment firms have started making home loans to borrowers who fail to meet banks' requirements, which got tighter post-crash and have largely stayed that way. And for now they are holding them on their books, which is novel. At least two, Athas Capital Group, of California, and New Penn Financial, which is owned by Shellpoint Partners, of New York, are also making jumbo loans, or loans in most parts of the country that exceed $417,000, as the federal government appears to be scaling its support of that market. The loans are designed to include borrowers with credit scores deemed low by banks' standards; they also have more-flexible requirements for proof of income. Banks have been too slow to extend credit to such people, the firms say, leaving otherwise responsible borrowers out in the cold—and potential profits on the table. "It's often a minor detail, why banks won't approve them," says Brian O'Shaughnessy, chief executive at Athas Capital. Banks are following standards set by the market and reinforced by regulators, which focus on avoiding risk and losses with the uncertainty that exists now, says Bob Davis, executive vice president at the American Bankers Association. The firms say this is far from the subprime lending of the go-go years. While they may embrace slightly riskier borrowers, they require higher down payments, around 40% on average at Athas Capital, compared with roughly 10% for a bank loan, says Keith Gumbinger, vice president at HSH Associates. And while they are willing to be flexible with income documentation, accepting a workplace pay stub or a series of bank statements in lieu of tax-return documents, they still require documentation as proof a borrower can repay the loan. This opens the door to otherwise qualified borrowers who have been foreclosed on, for example, or who may be self-employed or recently unemployed but are now back to work, says Chip Cummings, president of Northwind Financial, a consultant to mortgage lenders. Critics say the loans are similar enough to the subprime mortgages of old that would-be borrowers should beware. They often have a so-called balloon structure, which requires the borrower to pay the remaining balance after five or seven years, or to refinance. And they are expensive, with interest rates of as much as 13%, the loans can cost more than double the average for bank mortgages. "You'd have to be fairly desperate to take that in the current market," says Guy Cecala, publisher of Inside Mortgage Finance. Given the recent economy, that includes a lot of people.With housing prices still so relatively low, many people may want to buy, which analysts say could fuel a boom in this sector. Also, starting in October, the government is expected to lower the limit on the loans it guarantees to as low as $271,050 in some places, in some cases a drop of almost $100,000. That, too, could open the door for these private financing companies. 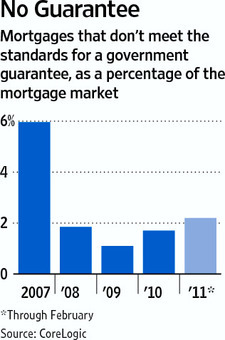 "There are a lot of borrowers out there who aren't being provided for," Mr. Cummings says. "Private investment firms are filling the gap."